Unique German Shepherd Gifts for you or that someone special. All of our German Shepherd items are handmade in our Northern California studio. Select from an ever-growing assortment of pottery shapes and have them decorated with your favorite version of German Shepherd – we currently offer German Shepherd gifts with black German Shepherds, black and tan German Shepherds, and black and red German Shepherds. You can even have the pottery customized with your dog's colors and patterns(an art fee applies). 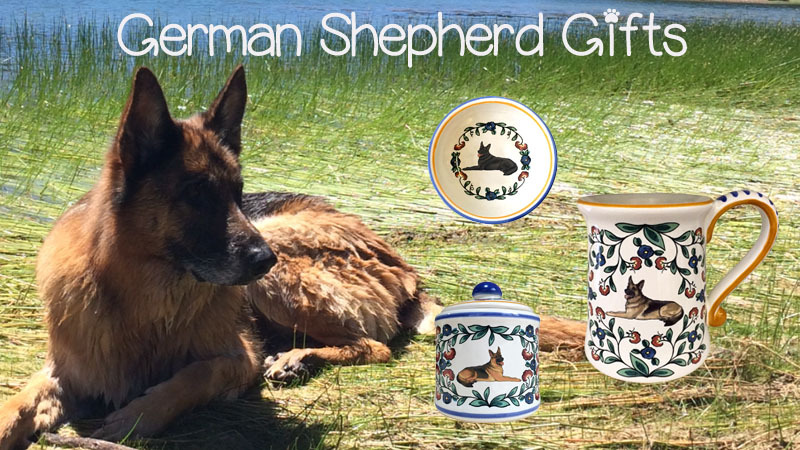 Our colorful German Shepherd merchandise includes wine stoppers, mugs, creamers, sugar bowls, dog treat jars and other items soon to be added. All of our German Shepherd items are made in small batches from scratch and is decorated with my original artwork in house. The result is a very special and unique gift for the German Shepherd lover, made with care and a lot of joy. The German Shepherd is near and dear to my heart, as it is the breed that inspired the beginning Shepherd's Grove – it is the dog breed that my own family has always had. Two German Shepherds have watched over our own little flock as it was hatched and has grown. The breed history is fascinating. At the end of the 19th centure, Max von Stephanitz and other dedicated breeders used long-haired, short-haired and wirehaired local shepherd dogs to produce the obedient, responsive and, let's not forget, handsome German Shepherd. Max's Horan was the first registered German Shepherd. The breed was popular throughout Germany by the beginning of World War 1 and quickly spread. Today, most countries only recognize the short coat for show purposes, though there are many people who love the luscious coat of long haired German Shepherds. I wonder if Max von Stephanitz ever thought the descendants of his Horan, would stretch far and wide across the world and become one of the top 10 dog breeds in the US. We are very happy to celebrate this breed with our German Shepherd Gifts!